On Monday evening I presented the final drawings to my clients in Ockley. 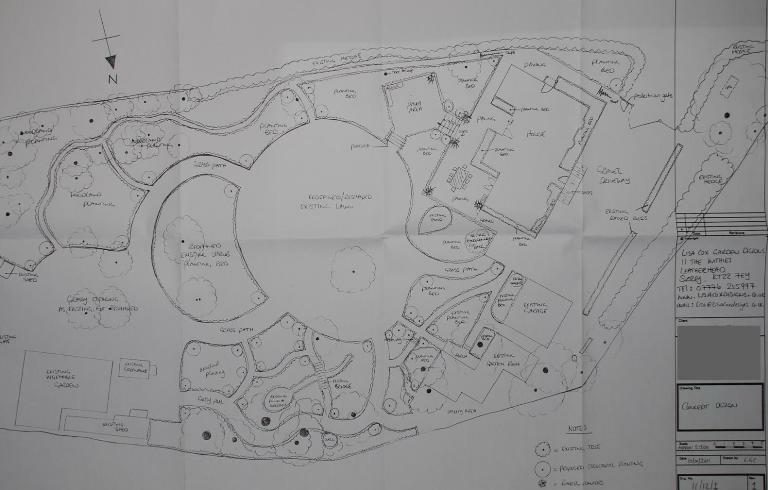 I love this part of my job because, although by this stage the concept design and sketches have been seen, it’s the moment when their new garden is revealed in all it’s glory! You might remember that I was commissioned to produce a concept design for the whole garden. A concept design is sketchy and, as the name suggests, is conceptual, but it works through the bare bones of a design and enables the clients to be involved with the creation of their garden. Any changes made to the design at this stage are easy to incorporate, if they are left until the final drawings are finished, there is a risk that the integrity of the whole design will be lost. 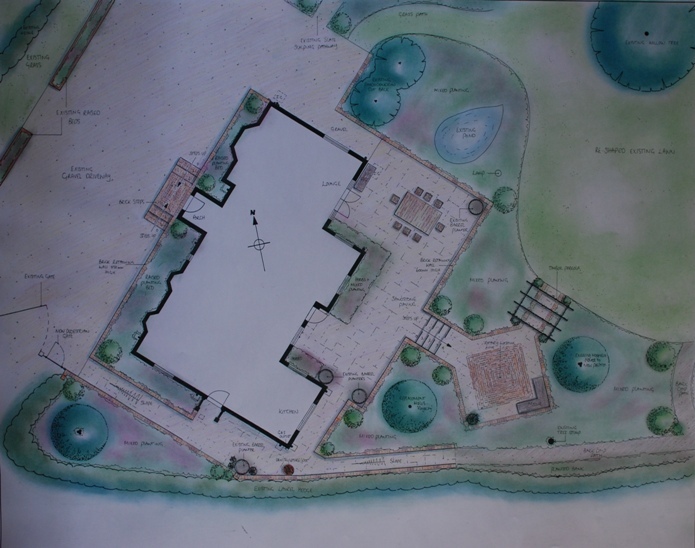 I then produced a worked up drawing with resolved levels and construction details for the areas immediately surrounding the house, as these are the elements which will be constructed first…. At the front of the house, we have increased the width of the driveway and the new steps to the front door have been designed to maximise the space. We have facilitated easy movement around the side of the house by introducing a slope to the side door where there used to be a big step and it is now possible to take a wheelbarrow around the whole garden without having to negotiate any complex changes in level – you might notice the utility path running along the perimeter hedge. Of all the changes to the existing garden, the new terrace area at the back of the house will make the biggest impact as we have eliminated the complicated levels and redefined the space and it can now be used comfortably for entertaining. The wide steps lead to a new courtyard area which has been designed to accommodate an existing arbour. The pergola will help to separate the space from the main garden and define the pathway beneath it. The planting around the terrace and courtyard will create a feeling of seclusion but will also link the more formal areas of the house to the rest of the garden. My clients are very excited about the design and can’t wait for the construction phase to commence in March. They have made a decision to phase the planting, but the difference the new structure and layout will make to the way they use the space will more than make up for a bit of bare soil for a while!